The past Monday my friend Jocelyn and I harvested wild bee balm, to use to make tea. We were catching just the end of the peak season: already many of the petals were turning brown. 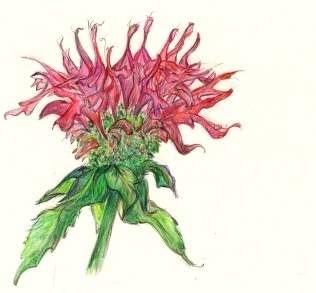 Wednesday I went looking for bee balm to draw, but I was too late. 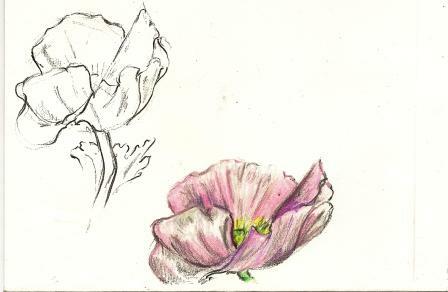 Although their light purple blush still colors the hillside, the individual flowers have begun to deteriorate beyond my interest in drawing them. Fortunately, the garden variety is still hardy near my doorstep, so for the second time this season I focused on this bright red floozy of a flower. This prints up nicely on envelopes. 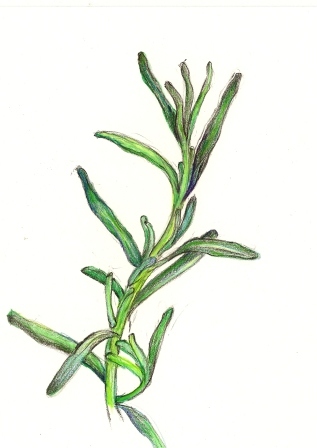 This sprig of rosemary is one of the drawings from Tuesday. It was done with my neighbor, Suvir, in mind, as he especially admired my drawing of parsley that I printed on an envelope and gave to him. I had a hard time with this herb. I did a couple of these, and gave a different one to Suvir. 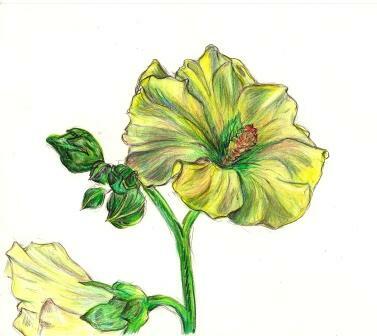 My husband, today, said the other (unpictured) drawing looked more like fennel than rosemary. Here is this morning’s drawing. 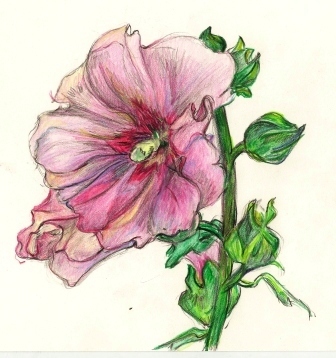 The drawings in this and the last post remind me of why I first became interested in books: drawing has always been important to me, and I discovered that making books was a way, for me, to organizing my images in a way that I found to be appealing. 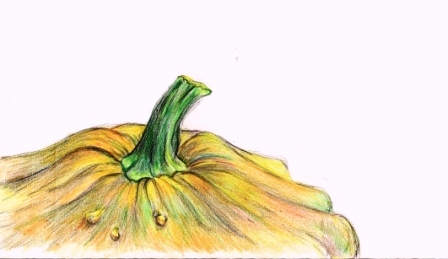 After a full, season of creating books with students in classrooms, I am happy spend my mornings wandering around my husband’s gardens, harvesting, then drawing the what I pick. 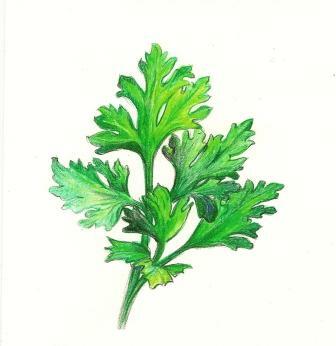 This parsley was picked and drawn this morning (colored pencil and drawing pencil) . It took me two mornings of trying to get the hang of the leaf shape. I started off these daily drawings by drawing on envelopes. 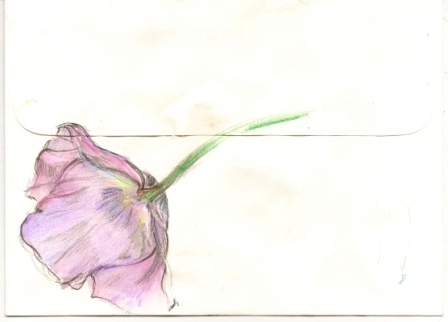 The first one I did, of garlic scapes, I sent off to my cousin John. I didn’t keep a copy of it, and immediately regretted it. Well, not really, but I started keeping the originals, and making copies. All on envelopes. After awhile I began to see a problem with drawing on envelopes…after I made a few prints, it was hard to tell the originals from the copies. Another problem with drawing on envelopes was that I would find it hard to position the drawing well on the page. I like the idea of printing on envelopes and sending these drawings off in the mail, so I decided to mostly work on drawing paper, then transfer the image to envelopes later. 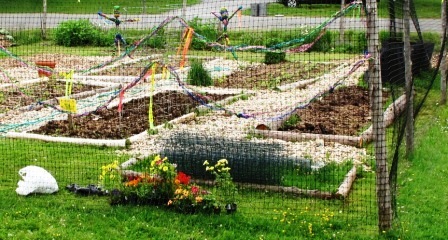 A lovely garden is springing up outside the windows of school children in Indian Lake, New York. Students and teachers have been working together to plant strawberries, lettuce, and other vegetables and flowers. The fourth grade teacher, Deb Starling, invited me up to the school to help the students put together something that would celebrate the garden. We made two dancing figures, which I thought of as kids in the garden. Because they are shiny, I hope that they will be discourage birds from raiding the bounty. 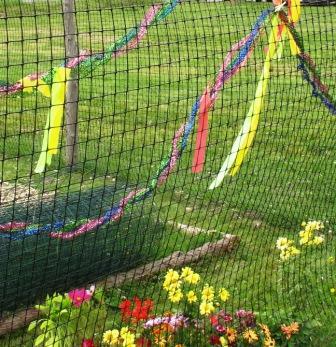 We also made shiny garlands to hang on the nets around the garden. 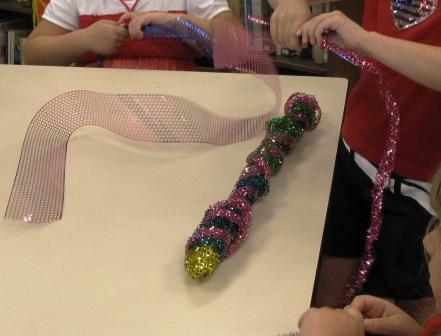 Students from Pre-K through Fifth grade participated in creating the garlands and the figures. We did our work in the air-conditioned library (thank you, Ms Starling). At the end of the day the fourth grade class carried everything out to the garden. 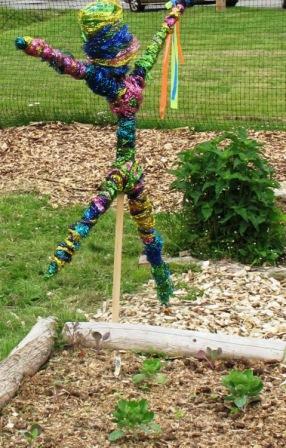 Wood and recycled materials were used to make the garlands and these dancing scarecrows. 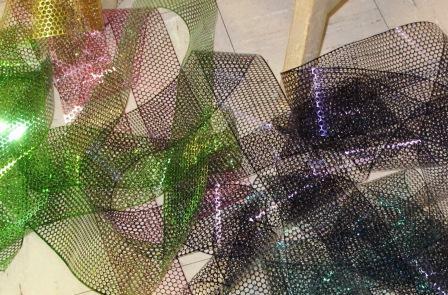 We began by scrunching up the metalic ribbon that is left over from making sequins. The Pre-K and Kindergardeners were excellent scrunchers. Students then wrapped these ribbons around picece that my dear husband had made late Sunday afternoon. The pieces he made resembled large tinker-toys. The garlands were made by scrunching many ribbons together. At occasional intervals we hung a tassle of colorful surveyers tape. The school librarian, George, recommended that we also hang some of these ribbons from the hands of the figures. This touch help to further create a sense of movement. 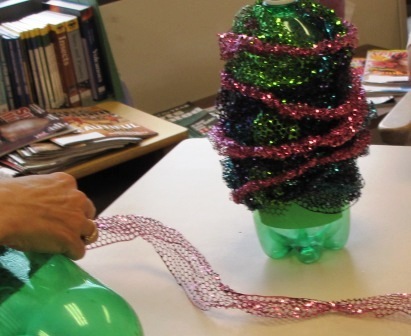 The heads were made from wrapped soda bottles. In a few days the students will be out of school for the summer. 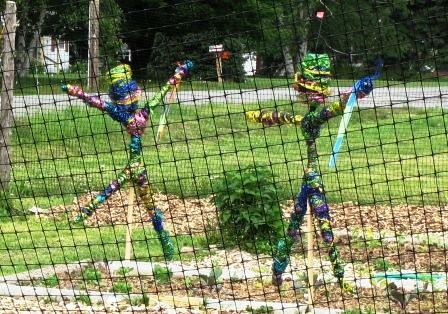 Hopefully these dancing figures will keep the garden filled with the feeling of their presence.